I beleive I am following the guide as is. Is there anything I am missing? I am using the Ue 4.15 just like the guide and the setup is the same. Damn, error in "PerTrackCompression" again. It happens with Paragon, Fortnite, and a few other games. Such animation has garbage inside, and I think it is simply not used in the game, otherwise game should crash. All I can advice at the moment - skip such animations. Thank you for the fast answer. 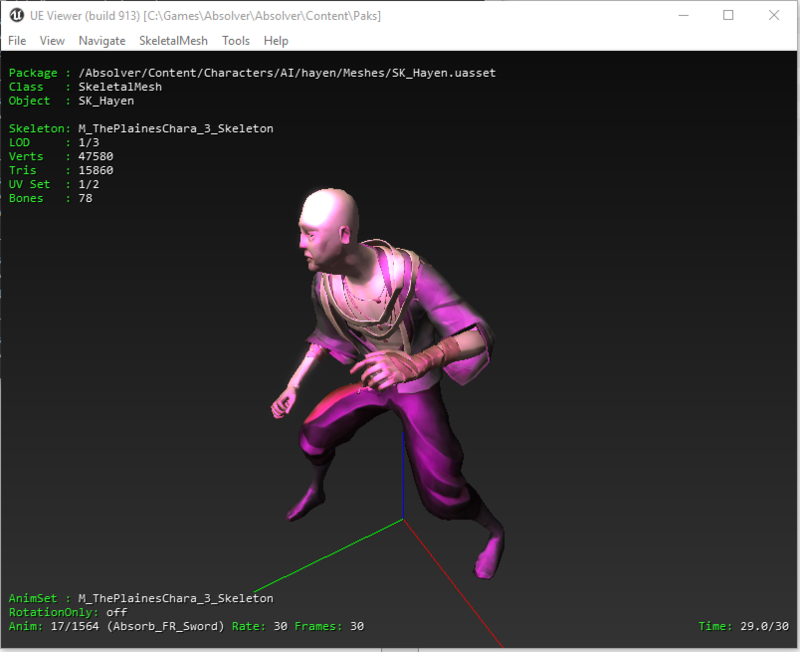 I have tested 67 different animations from the various children of the animation folder from the Absolver game, and even the one shown to work in the imgur tutorial I posted above are not working, they all show the same fatal error message. I feel like all the animations are off limits as of now. On another note, would your program work on older game made in the 2000 like Sacrifice from Shiny entertainement (http://store.steampowered.com/app/38440/Sacrifice/)? It uses directx 7 I think. I spent a lot of time researching Unreal engine code, and wasn't able to find any workaround for bad animations. Deeper research would require attempts to load cooked meshes and animations from Paragon or Fortnite into the basic Unreal engine 4 and trying to debug code there, but this requires too much time - mostly because the engine can't do this at the moment, I'll need to patch it. Regarding "Sacrifice". I know this game, that was probably "first TnL game" ever. I think it uses some in-house engine, not Unreal. Please try loading animations again (with new umodel). I've fixed one bug there which caused problems with animations in some cases. After the release of ABSOLVERS new DLC they have taken the liberty to encrypt the files, can anyone retrieve this aes key for the rest of us to use? Bump, noone will help? This games assets and animations are very cool and id like to do some more digging. Thanks, I've updated the table with new engine version.